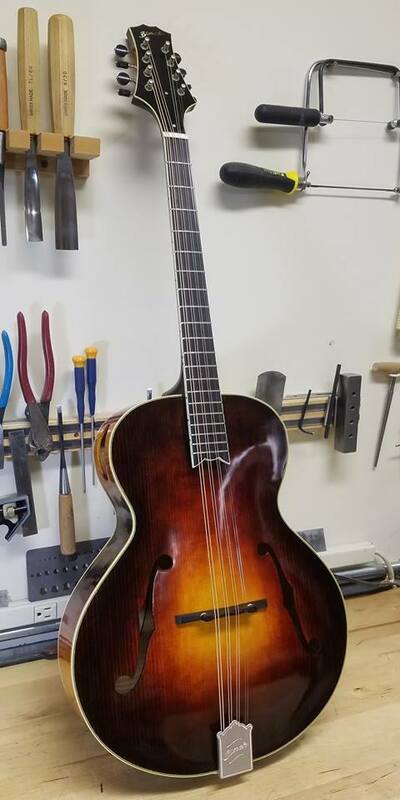 I just received a new guitar body octave mandolin (GBOM) crafted by luthier Mike Black of Mike Black Mandolins It’s a beautiful instrument to play and look at, and I can’t put it down. In a past post, I featured two other instruments — my original Trinity College Irish bouzouki and the guitar body Irish bouzouki that luthier Paddy Burgin in New Zealand made for me. I still have the former, but I sold the latter. Its flat top gave it a sound more like a guitar than something in the mandolin family, which was not what I was looking for, although the instrument was beautiful. The Black GBOM has that distinctive mando family sound, with a richness that far exceeds the commercially produced Trinity College bouzouki. Also, because octave mandolins have a shorter scale length (21-3/4″ in this case) than bouzoukis (the Trinity College scale length is 26″), it is significantly easier to play — the frets are closer together and the string tension is considerably less. All around a fantastic instruments! Note: By all means comment on this post, but I routinely get a million comments (slight exaggeration), solicitations really, from website developers pushers wanting me to buy there services. If you’re really interested in commenting about this instrument or other music-related things on my website, you might want to send me a message via the Comments page.